March 5, 2015 - A crippling polio outbreak has struck children in the conflict zone of Syria. A group of dedicated volunteers are risking their lives to vaccinate children in areas held by the Islamic State (also called ISIS), often working in areas targeted by airstrikes. Because these war-torn areas lack proper medical services, the volunteer vaccinators feel it is their duty to save Syria's children. 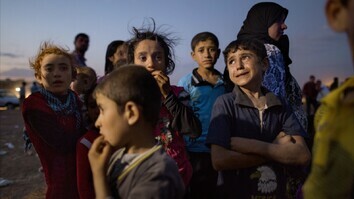 Read this article about the efforts to vaccinate children in the Islamic State-controlled territory in Syria. TWO AND A HALF YEARS INTO SYRIA’S CIVIL WAR, A HOSTILE NEW THREAT EMERGED IN THE NORTHERN CONFLICT ZONE. MOTHER: We thought it was the flu or a high temperature. We kept going to the pharmacy and doctors, and we gave her a shot in her right leg because she can’t stand on it. ILAF WAS ONE OF 36 SYRIAN CHILDREN CONFIRMED LAST FALL TO HAVE THE CRIPPLING POLIO VIRUS. HASSAN: We reacted very powerfully and very quickly to this outbreak. DR. TAMER HASSAN BELONGS TO AN OPPOSITION TASK FORCE BASED IN TURKEY THAT WAS FORMED TO STOP POLIO. HASSAN: Transportation is a problem, so it’s our responsibility to reach every child. ONCE ENOUGH VACCINES WERE STOCKPILED, THE TASK FORCE ENLISTED LOCAL COUNCILS AND DOCTORS IN REBEL-HELD AREAS TO TRAIN A SMALL ARMY OF VOLUNTEERS FOR AN UNPRECEDENTED DOOR-TO-DOOR CAMPAIGN. TEACHER 1: The symptoms are permanent. Once you reach paralysis, 99 percent have no chance of recovery. TEACHER 1: It’s hard to distinguish it from other diseases. Its primary stages are similar to that of influenza and the common cold. TEACHER 2: Here’s an example of a vial that I purposefully spoiled. I exposed it to high temperatures so that we can use it for comparison. VOLUNTEER: What if the time period is short? Like one or two days between vaccinations? TEACHER 2: The vaccine wouldn’t work but there are no harmful effects. VOLUNTEER: That was my question, about the harmful effects. TEACHER 2: There would be no harmful effects. THE VOLUNTEERS WOULD HAVE TO NAVIGATE A MINEFIELD OF REBEL MILITIAS AND ATTACKS FROM RUTHLESS GOVERNMENT FORCES. RADWAN: In the freed areas, the regime considers us enemies of the state, even if you’re working on a polio vaccination campaign. DR. MOHAMMAD RADWAN IS A TASK FORCE COORDINATOR IN ALEPPO, SYRIA’S LARGEST CITY. RADWAN: The biggest danger in all areas is airstrikes, and airstrikes aimed at groups of people. … In addition to the absence of primary health care, the doctors from these areas are gone. No more than ten percent remain. DESPITE THE RISKS, AND PAY OF JUST SEVERAL DOLLARS A DAY, THERE WAS NO SHORTAGE OF VOLUNTEERS TO FIGHT POLIO. RADWAN: We faced no difficulties in recruiting people. They were very excited about the idea. A large amount of volunteers joined us to be vaccinators. IN THE MONTHS AHEAD, MORE THAN 8,000 VOLUNTEERS FANNED OUT ACROSS REBEL-HELD AREAS. TO BE FULLY IMMUNE, EACH CHILD MUST BE VACCINATED AT LEAST THREE TIMES — A DAUNTING TASK IN A TIME OF WAR. VOLUNTEER 1: There’s a lot of destruction and an unusual amount of displacement. There are no people and we can hardly find anyone. AS THE CAMPAIGN WORE ON, THE SYRIAN ARMY TARGETED VOLUNTEERS WITH BARREL BOMBS, CRUDE METAL DRUMS PACKED WITH EXPLOSIVES. HASSAN: You have 20-30 seconds until the barrel hits the land. So it’s very terrifying. One of the volunteers was coming out of the building after finishing the vaccination of the children there and just after he came out a barrel came and destroyed the building. Even the children inside who were vaccinated were killed, too. FOUR VOLUNTEERS WERE KILLED DURING THE FIRST SIX MONTHS OF THE POLIO CAMPAIGN. IN BESIEGED AREAS THAT HAVE GONE YEARS WITHOUT MEDICAL SERVICES, LOCALS HAILED THE VACCINATORS AS HEROES. LOCAL 1: Truthfully, this is a new thing, something we never saw under the regime. I mean someone knocking on your door and asking you if you have children, are they vaccinated? This is something we have never seen. VOICE: What do you think of the vaccination campaign? LOCAL 2: We are thankful — may God give them health. TO DATE, THE TASK FORCE HAS IMMUNIZED SOME 1.4 MILLION CHILDREN AGAINST POLIO. ACCORDING TO THE UNITED NATIONS, NO NEW OUTBREAKS HAVE BEEN RECORDED INSIDE SYRIA. HASSAN: We proved that we have the capability to do impossible things. BUT IN RESTIVE AREAS LIKE DEIR EZZOUR, POLIO’S VICTIMS ARE LEFT TO GRAPPLE WITH THE SYMPTOMS OF A WAR THAT SHOWS NO SIGN OF ENDING. 2.5-YEAR-OLD NUR’S FATHER WAS KILLED ON THE BATTLEFIELD. GRANDMOTHER: She is stuck with this disease - polio. WITH THOUSANDS MORE CHILDREN STILL OUT OF REACH, THE TASK FORCES’ WORK IS FAR FROM OVER. AFTER SEVERAL DAYS OF REST IN TURKEY, RADWAN WOULD HEAD BACK INTO HARM’S WAY. VOICE (off-camera): What drives you to continue this work? RADWAN: Children … After all, if all of us leave the country, who’s gonna save these children? We must have teams on the inside, even if it costs us our lives. 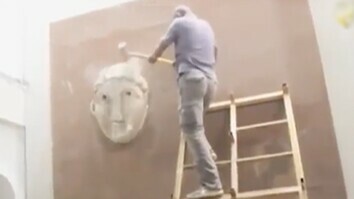 ISIS Antiquities Destruction: What Can Be Done?